CLARENCE, N.Y.--(BUSINESS WIRE)-- 22nd Century Group, Inc. (NYSE MKT: XXII), a plant biotechnology company that is a leader in tobacco harm reduction, announced today that its Central American growing program is a great success. Now nearing harvest, the specially-propagated Central American tobacco crop is expected to produce sufficient quantities of Very Low Nicotine tobacco seed stock to support 22nd Century’s increasing distribution of Very Low Nicotine (“VLN”) tobacco cigarettes in Europe, as well as the anticipated future distribution of VLN tobacco cigarettes in the United States, and the potential sales of VLN tobacco leaf in Asia. As reported in October 2015, the United States Department of Agriculture (USDA) issued a phytosanitary certificate to 22nd Century to facilitate export of the Company’s proprietary Nicotiana tabacum (tobacco) seeds to select growers in Central America. As a result of the Company’s successful field trials, the proprietary Very Low Nicotine tobacco seed in production will allow 22nd Century to greatly expand its tobacco leaf growing programs in both the United States and in Central America. 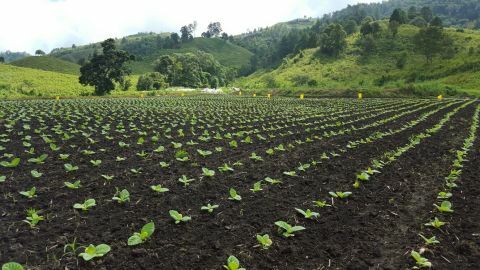 The tobacco plants in Central America are expected to produce seed sufficient to grow tens of thousands of acres of Very Low Nicotine tobacco. 22nd Century is a plant biotechnology company focused on technology which allows it to increase or decrease the level of nicotine in tobacco plants and the level of cannabinoids in cannabis plants through genetic engineering and plant breeding. The Company’s primary mission is to reduce the harm caused by smoking. 22nd Century currently owns or exclusively controls more than 200 issued patents and more than 50 pending patent applications around the world. The Company’s strong IP position led to a licensing agreement with British American Tobacco (“BAT”), the world’s second largest tobacco company. Visit www.xxiicentury.com and www.magiccigarettes.com for more information.